A few months ago on Twitter, I admitted that I was shopping for kaftans. I’ve been on a huge Three’s Company kick all summer, finding myself more interested in Mrs. Roper’s wardrobe than the storylines. If you’ve ever watched Three’s Company you know that every episode revolves around some sort of misunderstanding. But Mrs. Roper’s kaftans just keep getting better and better! The kaftans are so over-the-top fabulous and comfortable looking that I decided I needed one of my own. While I was deciding, we started chatting (on Twitter) about kaftans and Mrs. Roper and we all decided that we should get together and wear kaftans and lounge on the lanai. The Mrs. Roper Party was born. 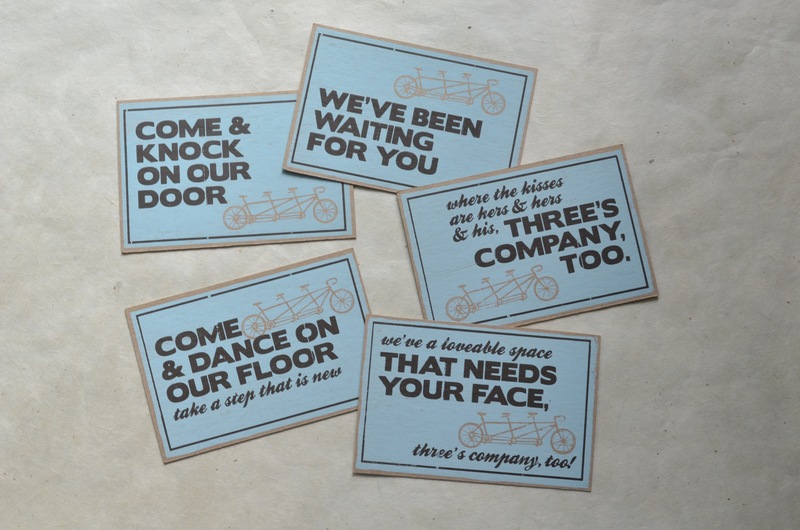 I didn’t need to send invitations, but I had these fantastic Three’s Company theme song postcards from Zerobird Studio, so I sent them as little reminders about the party. I had so much fun looking through old cookbooks and Pinterest for late 70s/early 80s recipes. 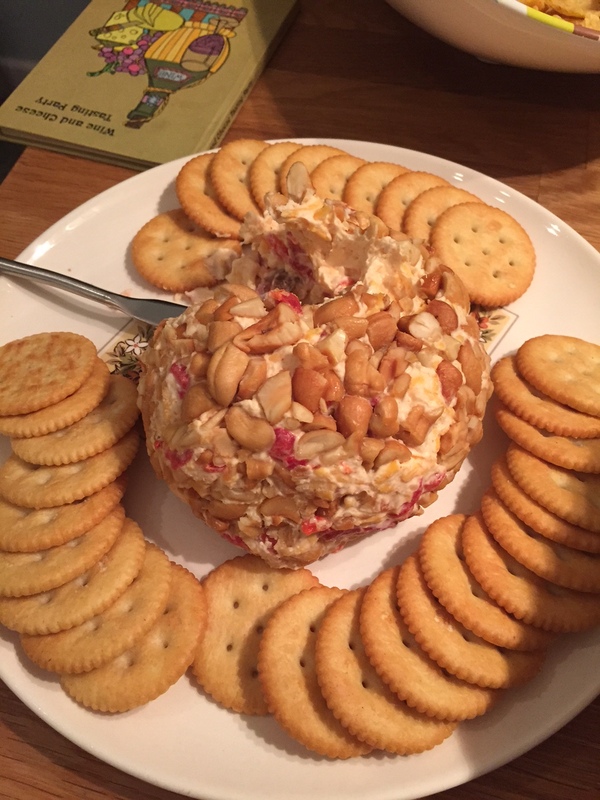 For appetizers, Katie made crab dip, served on a groovy platter and I made a cheese ball, (I cut this recipe in half and used pimentos instead of green chiles and chopped cashews instead of pecans.) 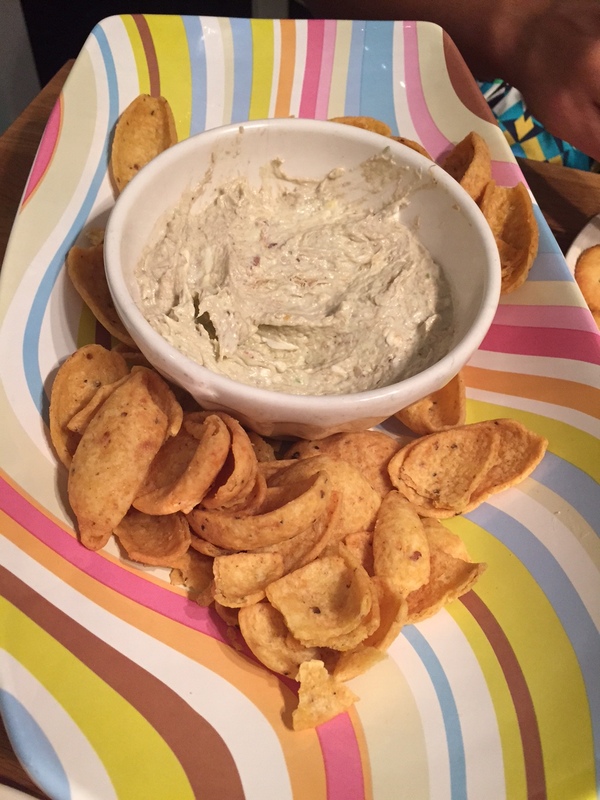 served with classic Ritz crackers. 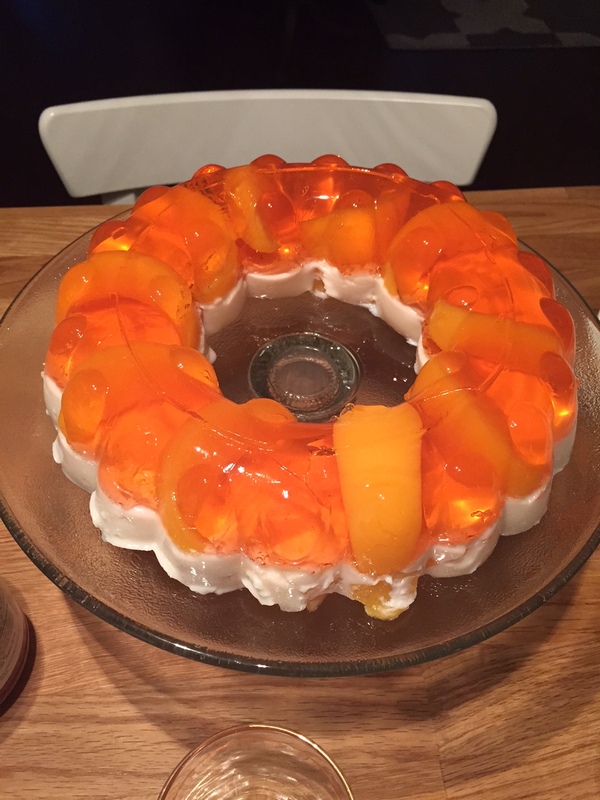 And I made a Jello mold! It wasn’t beautiful (My peach slices didn’t stay put and ended up floating around instead of making a pretty ring…rookie mistake) but it was delicious. And it was my first time using my vintage Tupperware mold and worked like a charm! For dinner we ate pineapple chicken (I used this recipe, but substituted canned pineapple for fresh, because 1970s…) and store bought fried chicken. As much as I wanted to stay on theme and make a Southern Comfort punch for the party, I just couldn’t bring myself to do it. Instead, I made a classic cocktail, the Sidecar. (Thanks, Kathy, for the photo above!) I was going to serve Brandy Alexanders with dessert, but we finished the brandy thanks to bartender Naoto keeping our glasses constantly filled. We had chocolate fondue for dessert. My parents gave me a vintage 1970s fondue pot and this was the first time I used it. 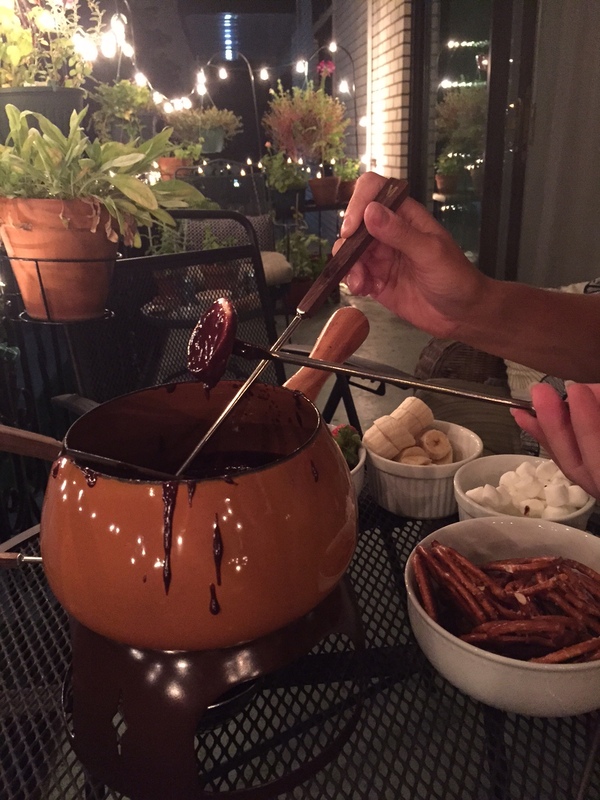 (Fondue was so easy that I’m not sure why we don’t do it more often.) The weather couldn’t have been more perfect for lanai lounging. My only regret is that we didn’t get a full-length picture of us all in our kaftans. Other than that, 1970s entertaining is easy living. 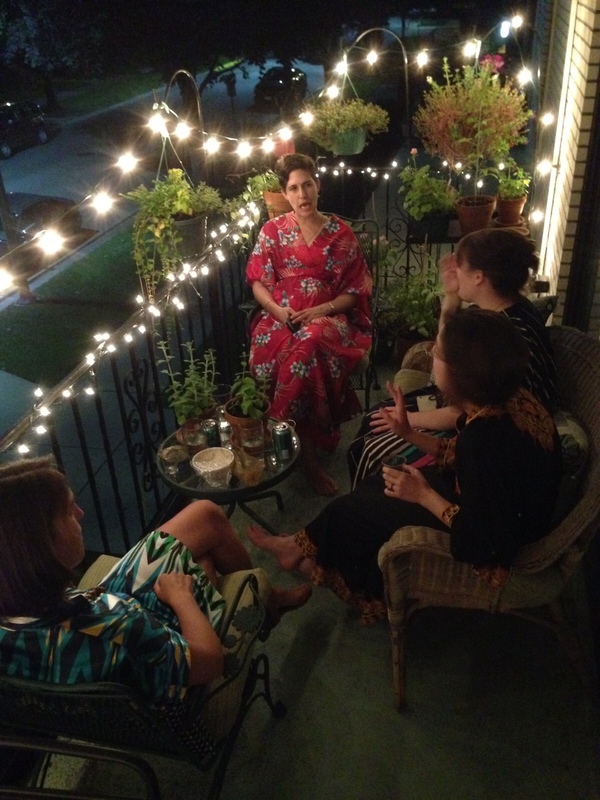 Not only did I get to throw on a breezy kaftan, but I could have made most of the recipes out of my pantry. Normally I’m rushing around buying fresh produce and chopping fruits and vegetables for party recipes. This time, I opened cans and boxes–Jello, canned peached, canned pineapple, crackers…everything just got tossed together. 1970s hostessing is amazing! Thanks to Katie, Donovan, and Kathy for being up for a kaftan party and to Naoto for taking care of all of us Saturday night. Next up…sometime in the future…a Golden Girls party complete with cheesecakes! YOU ARE THE GREATEST. I am so honored that you are my penpal. Thanks, Danielle! I’m honored that YOU are mine! Oh what a fun party that was! You pulled off the theme splendidly! Thanks, Julia! 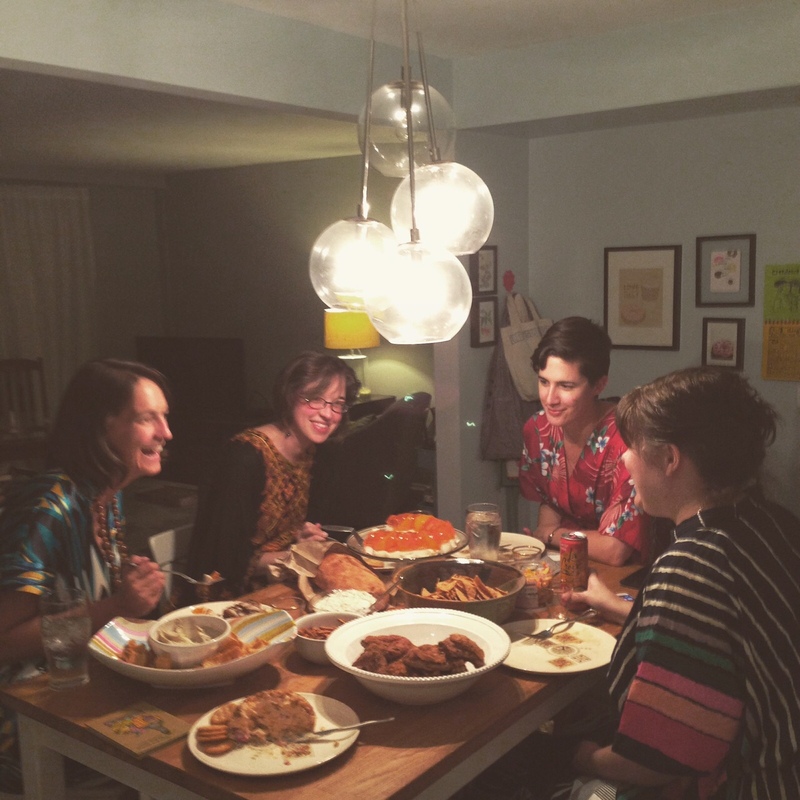 It was a really fun party to plan! I LOVELOVELOVE this …. I linked your post on my blog. Just bought my first kaftan! Oh! You’ll have to let me know how you like your kaftan! I live in mine in the summer, even when having people over and I think I need to add to my lounging lady wardrobe! And yay for Elgin! We have a friend from there! Thanks so very much for stopping by! I absolutely LOVE my kaftan … it’s a deep blue with gold trim and, even though I keep catching the sleeve on my dresser (!lol) I love the freedom I feel in it. 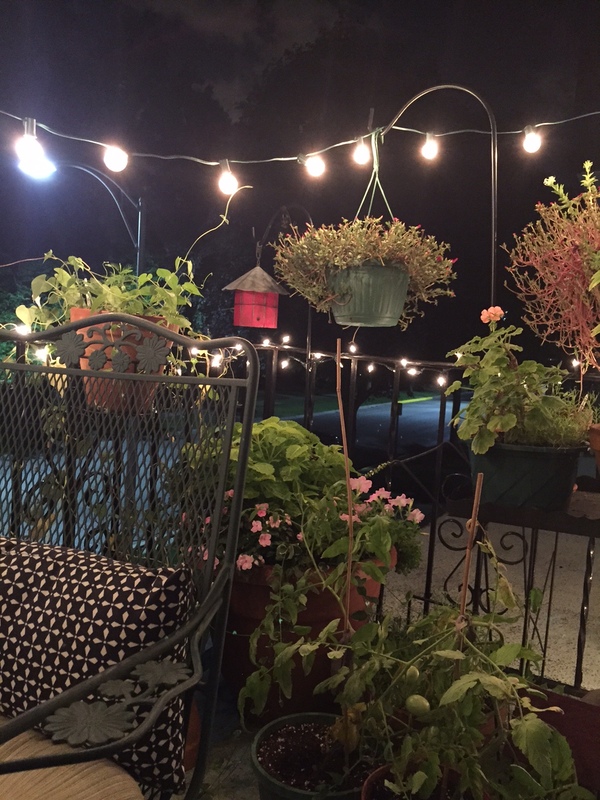 I’m pretty sure that when I get a house with a lanai (some day), I’ll be in it ALL the time! the one I have is silk, so I’m not exactly sure how I should launder it. do you think it’s safe in the regular wash? oh, and btw, I’m a Chicago-suburb-born girl myself — born in Elgin, IL, now live in St. Louis, MO (blech). Go Cubs and Blackhawks!